Ängsö is one of Swedens beautiful national parks and only a short distance away from the capital city of Stockholm. 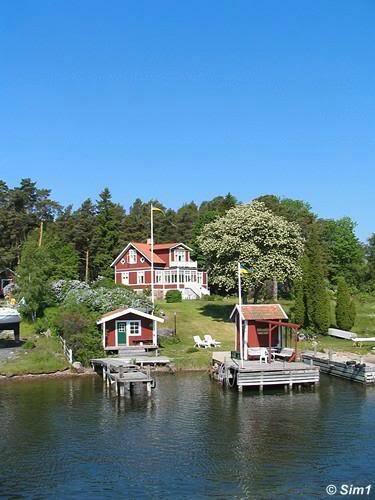 It's an idyllic little island located in the beautiful Stockholm archipelago. This little island is known for its beautiful and unique meadows. In June 2006, on a wonderful sunny summer day, I visited this little island filled with flowers. I asked for this daytrip as a birthday present, and I couldn't have wished for anything better! If you love islands, blue sea, rocky shores and a sea of flowers (and you don't mind the absence of restaurants or luxury), then this is your place! The 13th of June, a sunny day, blue skies and amazing warm weather. What a perfect day to go out and discover some more of the Stockholm archipelago and the wonderful little island and National Park of Ängsö! Ängsö is a little gem of an island, hidden away in the beautiful Stockholm archipelago. 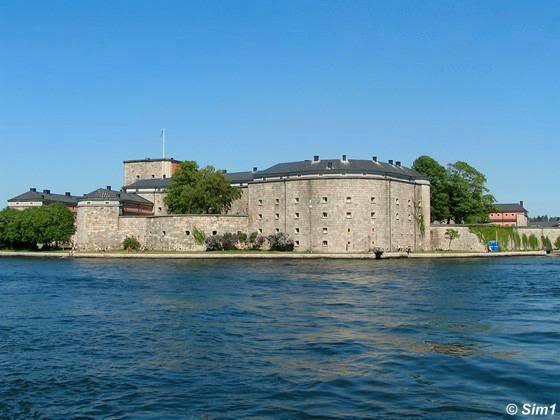 The way to get here is by ferry, either leaving from Stockholm or from some of the stops along the way. We decided to hop on board in Vaxholm, a nice town located north of Stockholm and a perfect starting point for discovering the Stockholm archipelago. It doesn't take long before our ferry arrives. The boat is rather packed with people on the upper deck, as everyone wants to enjoy this gorgeous sunny day to the fullest. 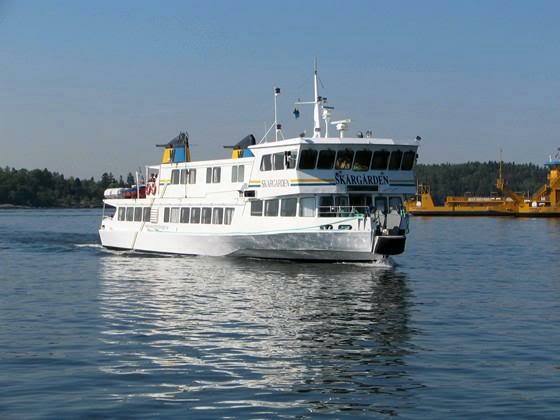 The ferry comes from Stockholm and stops at Vaxholm (among other places) to pick up more passengers, including us. The sea looks so blue; the sun is shining brightly and glistering in the water. The boat moves with a rather high speed, zigzagging around the many islands that the archipelago consists of. The wind is blowing through my hair, sunglasses on, and I am totally enjoying the views, the sunshine and the fresh sea breeze. Colourful houses decorate the shoreline of the mainland and are bright little dots on the many small islands. At times the boat slows down considerably as it needs to manoeuvre its way through a small passage between two islands. Sometimes it amazes me how we are able to get through these narrow passages, but the ferry doesn't seem to have problems with it at all. The speed increases again and we race over the waters. After 1 1/2 hours on the boat we finally are there: Ängsö! Ängsö is part of the Stockholm Archipelago; a unique place and one to fall in love with. It consists of 24000 islands and inlets. Little dots of land and rock surrounded by clear blue water. 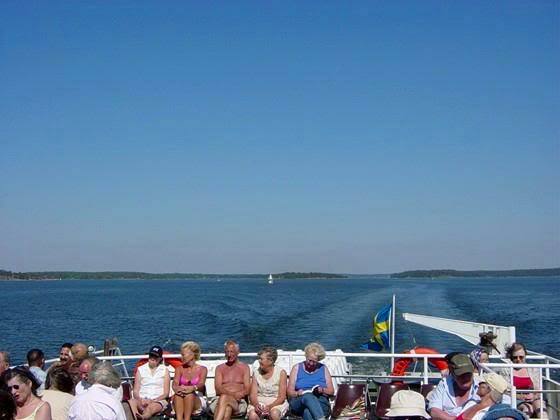 The Archipelago is quite popular among the Swedes and for a good reason. But having said that, it still isn't overcrowded. About 150 of the islands are inhabited all year round, a tiny percentage if you look at the total amount of islands around. I think the best news is that the Archipelago is easy to visit, with ferries connecting a lot of the islands, some of them offering hostels, hotels and even campgrounds and all in easy reach from Stockholm! This is my first visit to the archipelago, but I absolutely loved it. A next visit will probably be island-hopping, bicycle vacation. A combination of taking the ferry from one island to another, bicycling around on the islands and staying in some of the hostels. I can hardly wait! 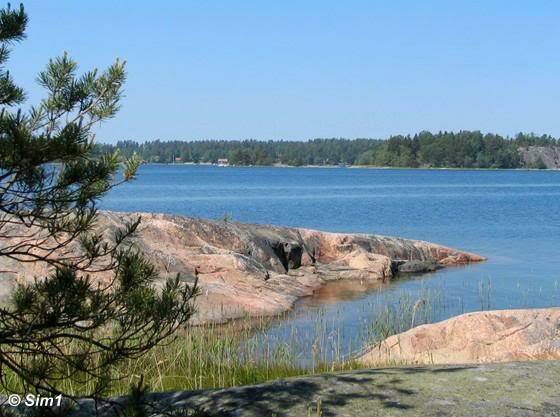 The island of Ängsö is small, only 73 hectares, but so worth visiting. Quite a few people get off the ferry, but some stay on board continueing their way to another destination in the archipelago. While getting of the ferry I almost feel like panicking for a moment, realizing that the peace might be disturbed in a terrible way by all the people coming from the boat wanting to visit Ängsö. And of course they all booked their ticket on the boat for the guided walking tour around the island as well!!! I was looking forward in having a guide telling me more about the flowers and special landscape of the island. But I was probably naive in imagining it would be a group of only 5 to 10 people that would join this tour when we bought the tickets on board the ferry. I certainly wasn't expecting the crowd that were gathering now; it must have been around 50 people and probably even more! Within 2 seconds time we made up our minds to forget about the guided walking tour, but chose to discover the island on our own instead. Without time to waste we hurried off by ourselves and with a sigh of relieve we feel the embrace of the beauty and tranquillity of Ängsö, far away from the crowds. 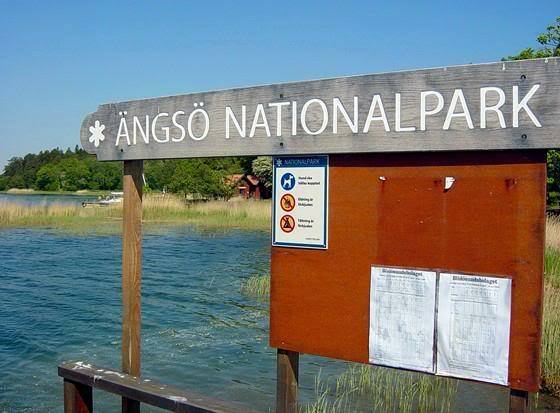 Before we walk on I would like to tell you a bit more about Ängsö National Park, which is one of Sweden's first National Parks. The National Park was created in 1909, the same year as the National Parks of Abisko, Garphyttan, Gotska Sandön, Hamra, Pieljekaise, Sarek, Stora Sjöfället and Sånfjället were created. The total area of the park is 168 hectares, of which 93 hectares are water. 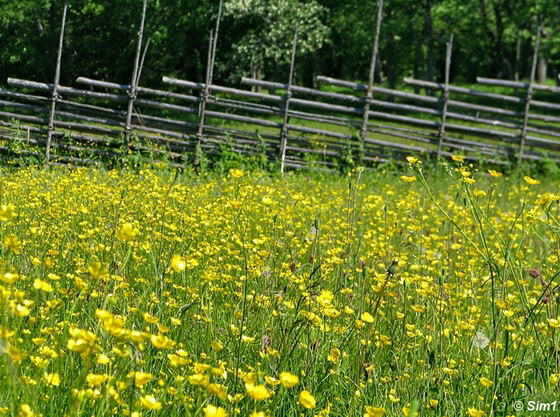 The National Park is loved for its ancient farm landscape located in the wonderful archipelago environment, and of course for its wealth of spring flowers. It also has a wide variety of bird life. 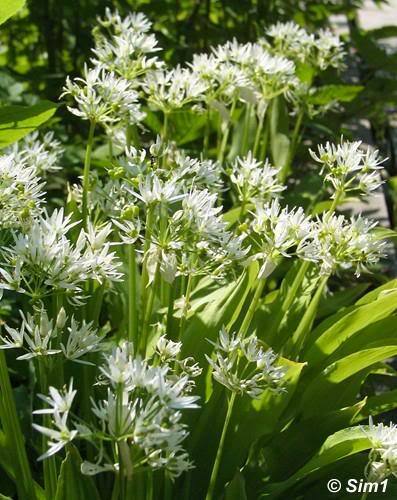 The best time to visit would be without a doubt the spring: early June or late May. 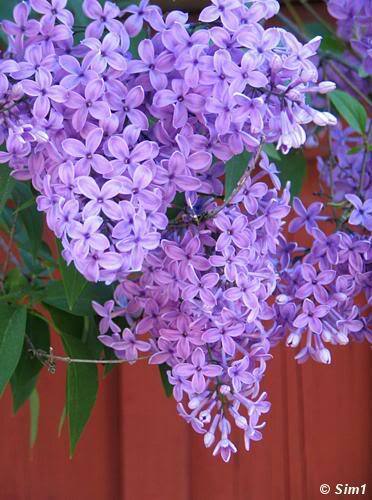 This is the time that most of the spring flowers are in full bloom and the island is at its best. The deciduous trees which dominate the island are oak, ash, maple and birch. The coniferous forest covers a third of the area of the park. In the photos you can see several views from this island taken mid June. The purpose of protecting Ängsö was to protect and display the traditional cultivated archipelago landscape and show how the old Swedish countryside used to be like. Strangely enough the creation of the National Park did just the opposite with Ängsö of what the protectors tried to achieve! So how did this all happen? Luckily at the end of the 1930s people started to realize their mistake and new plans were made to protect the island, but now in the way as it should have been done in the beginning. 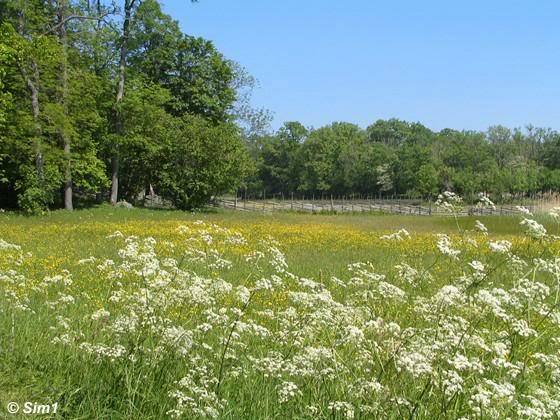 A large operation was carried out, and the island was cleared from the unwanted shrubs and trees, and the meadows were restored back into their old glory. The cows are back on the island and so is the farmer, just the way it used to be in the old days. The fragile balance between old style farming, hay making and grazing of the cows, is what keeps the meadows open and causes the unique flora to thrive on Ängsö. The old way of farming has continued and will continue on this picturesque little island hopefully for years and decades to come, giving back and maintaining its unique beauty and nature. 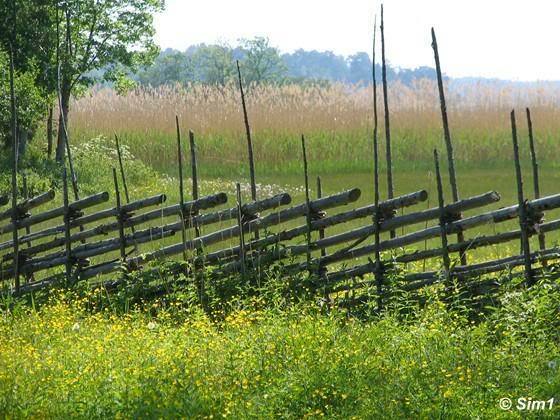 While walking around the island you can't really miss noticing the very typical and traditional Swedish fence called "gärdsgård" (which is pronounced something like yeahsgoard). 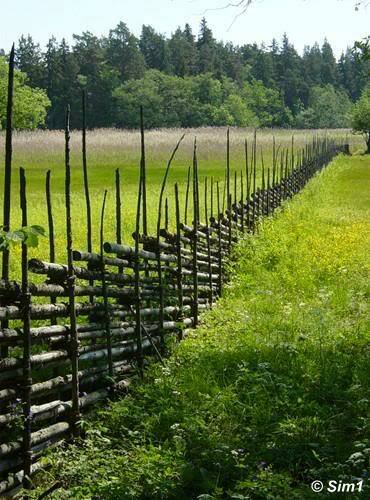 You can see this type of fence mainly in the area where the ferry arrives; around the farmhouse and a bit beyond. 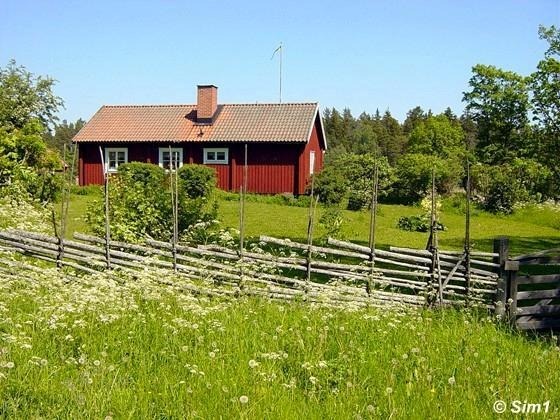 The gärdsgård hasn't completely disappeared from the Swedish landscape, and you can still spot them on numerous places if you keep your eyes open. 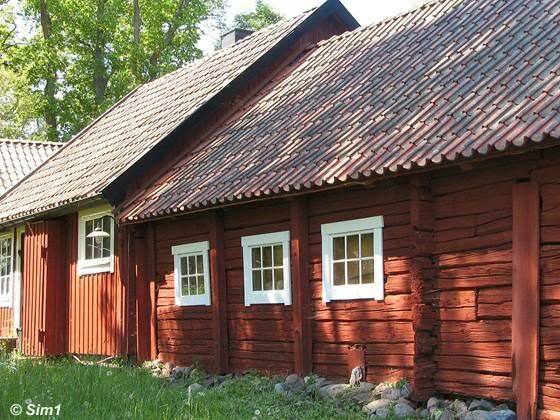 Nowadays the gärdsgård in mainly used around summerhouses, giving these little houses a bit of extra charm. 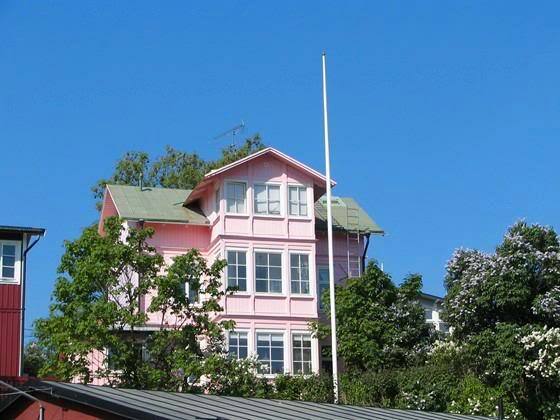 The gärdsgård is made from young thin trees. As you can see in the picture, the thicker side of the stem is mostly used upwards, while the thinner part is directed towards the ground. No nails are used, just wood. The "ropes" that hold the trees together is made from the bark of the trees. Another old-day tradition is visible in the trees close to the meadows, like the tree on the photo. These trees are being pollarded. 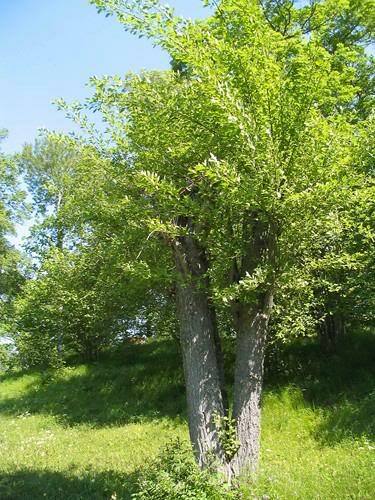 And a tree that has been pollarded is also known as a "pollard". The animals on the farm mainly lived on hay during the winter months, but in addition they were fed leaves. The technique of pollarding was to cut down the new branches from a tree every 3 to 5 years. 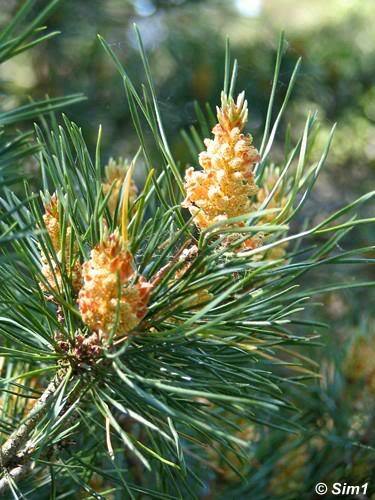 This would increase growth and increase the numbers of shoots produced by a tree and thus branches. More branches means more leaves, more leaves means more food for the animals. You can easily recognize a pollard tree by its form. The tree has an expanded (or swollen) node, which is topping the tree trunk. From here multiple new side and top shoots grow. On Ängsö they used the technique of pollarding on all type of trees, although mainly on Ash, Willow and Elm. A nice side-effect from the pollarding is that the trees created less shade over the sun-loving meadows. And as the old traditions and old style farming continues here on Ängsö, the trees are still pollarded, giving an even better view how the traditional Swedish country side looked like. And of course the meadows! And then there are of course the meadows; which probably will be the highlight of your visit to Ängsö. They look amazing on a sunny spring day! I visited in mid June, which is almost too late in the season to enjoy the meadow in their full glory. Visiting a week or two earlier probably would have been better. But they still looked amazing! 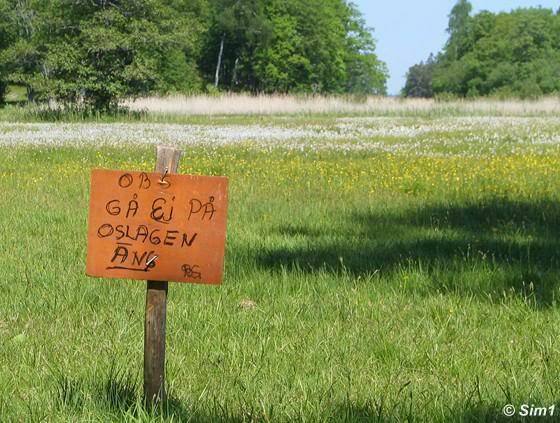 Only one-sixth of Ängsö is meadow. The largest one is Stormaren in the middle of the island. This is a damp meadow that used to be a channel of water between two smaller islands. The islands have now grown together, creating this damp meadow in the middle. The flowers that thrive on this meadow Stormaren are the bird's-eye primrose and the dwarf milkwort. Around the damp meadow of Stormaren are several drier meadows. Here you can feast your eyes over carpets of cowslips and wood anemones. 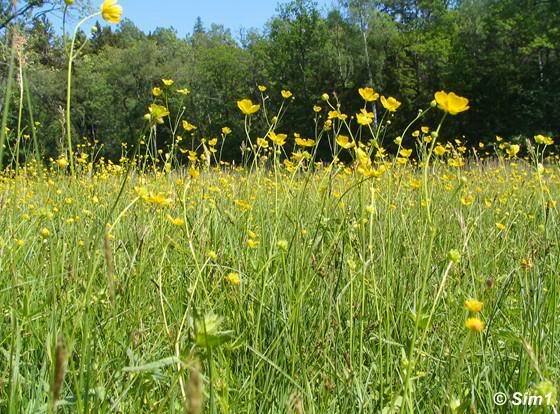 Although the flowers are wonderful and it is tempting, please don't enter the fragile meadows, as this will slowly destroy them. Do not walk on the meadows! The best way to enjoy this little idyllic place is to bring a picnic basket filled with some delicious food and a nice bottle of wine. There are no restaurants here, so it is best to arrive well prepared with a basket full of delicious items. My basket was filled with some wine, french bread, delicious ham, gravlax (thin sliced salmon) and several other snack foods. Follow the hiking trail, which will lead you through the meadows, and somewhere along the trail take a left turn, which will bring you to the shoreline. Sit down on the rocky shores overlooking the Stockholm archipelago, with its blue water and scattered around islands, and simply enjoy the food, the view, the sun and the flowers! If you are courageous you can even take a dip in the (probably cold) but crystal clear water of the Archipelago. You won't be the only one, as lots of guests of the island enjoy a dip in the water on a warm summer day. After your lazy lunch I would suggest to continue the tour around the island. As the island isn't so big, it makes for a lovely relaxing walk. 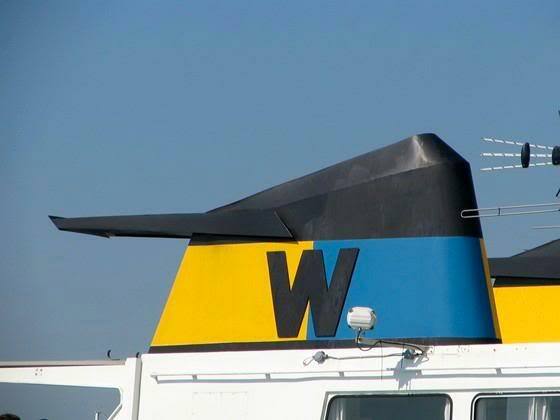 Keep in mind to be back on time to catch the ferry back home! 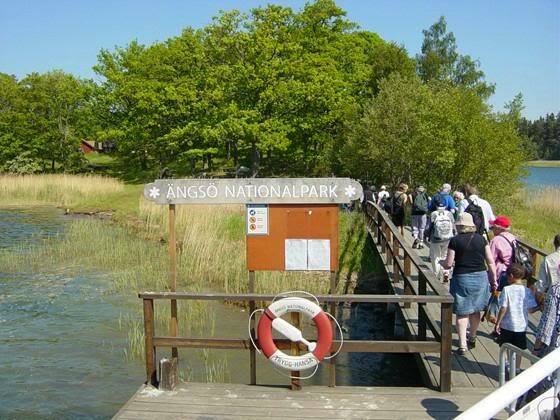 Of course Ängsö is known for its spring flowers, which mainly grow in the meadows in the centre of the islands. But it is not only there that you can see the flowers. There are so many different species in so many shapes, colour and sizes spread out over the entire island. 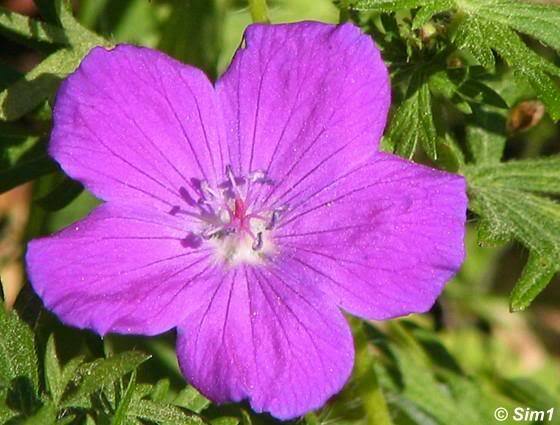 In the first photo for example you can see a member of the Geranium family, probably in this case a Ängsnäva / Meadow Crane's-bill, which proudly showed off its bright colours close to our picnic spot. In the next photo you can see a Rhinanthus Serotinus or the Greater Yellow-rattle, which dominated the waterside, waving happily from side to side in the slight sea breeze. 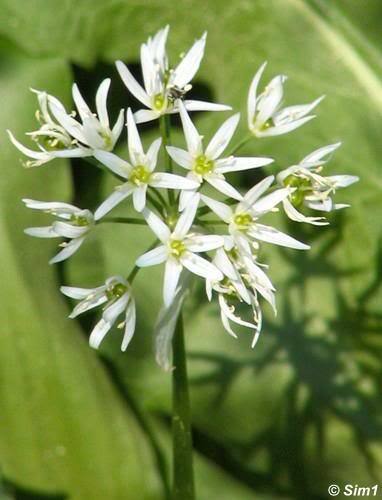 The photo below on the left is a flower that is famous on this island: the Cowslip or Gullviva in Swedish. 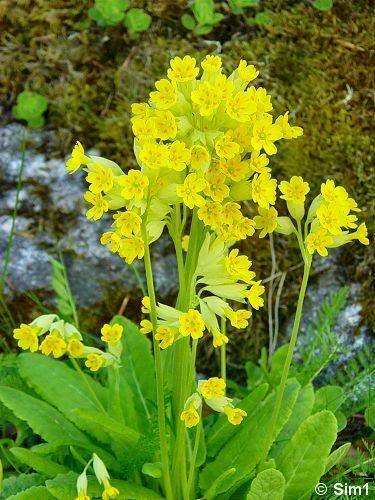 There weren't that many Cowslips flowering in the middle of June, as they were at the end of their flowering season. 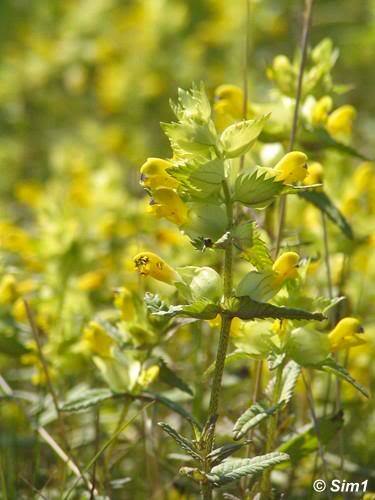 But in the beginning of June they fill the meadows with their bright yellow colour and cheerful looking flower. 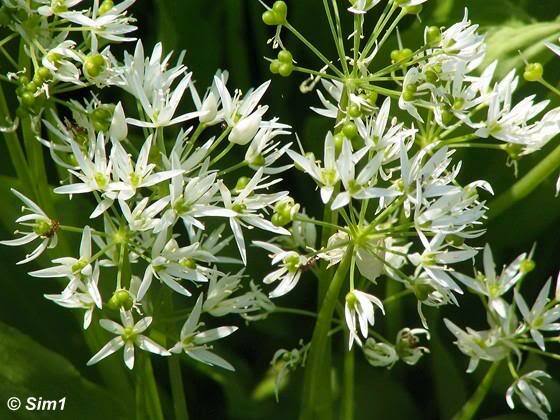 The plant that was blooming a lot in the meadows mid June was a slightly different type of plant. 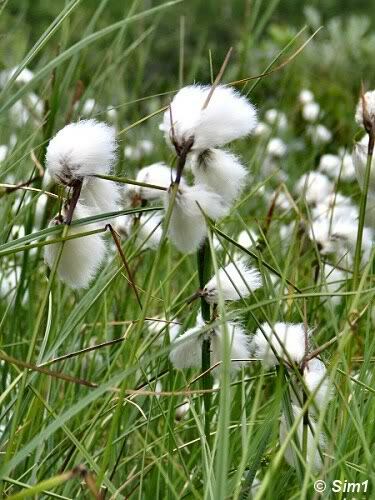 It is a member of the Cottongrass family (photo below on the right). This grassy plant, which looks so cute because of it little fluffy wool-like top, enjoyed the more moist conditions of the "Stormaren" meadow. Another flower that seems to thrive in the more moist conditions of the "Stormaren" Meadow is the Dactylorhiza incarnata (L.) Soó / Ängsnycklar or Early Marsh-orchid in English. I didn't see only one or two of these lovely orchids, but dozens and dozens of them, spread out over the whole meadow. It isn't every day you see orchids in the wild, so I found this rather special. But this isn't the only orchid variety that thrives on Ängsö. 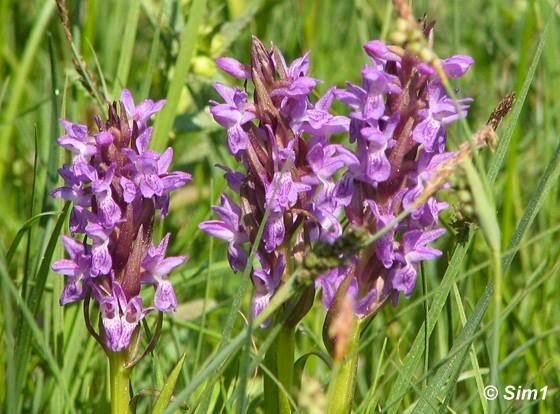 A bit earlier in the season you can see the Dactylorhiza latifolia also called the Adam and Eve orchid. The fun thing about this orchid is that they come mixed in red and a white flower variety. So you can see both colours mixed in one field, equally devided over the two. This orchid grows a bit more to the north of the island at at Norrudden. Other orchids that grow on Ängsö are the frog orchid, the greater and lesser butterfly orchids, common twayblade and bird's nest orchid. The North Eastern part of the island is totally different in character then the rest, but wonderful in its own way. We are now entering into the forest of Ängsö. This part of the island was left to develop naturally since the national park was created in 1906 and now has the character of a virgin forest. The shade of the trees, the aroma of the forest and forest flowers and of course the singing of the many birds that love this part of the island, make it a delight to walk around here. The only clear downside is that the mosquitoes seem to love this part of the island as well. So please don't forget to bring your insect repellent, or otherwise you will regret it! Only a small part of the forest is open to the public. A major section of the eastern side of the island (including coastline) is a bird sanctuary and forbidden to enter from the 1st of February to the 15th of August. The day has come to an end and it is time to make our way back towards the ferry. Everyone on the island, from young to old, seemed to have had a wonderful day. Laughter and smiles and a general feeling of joy are hanging in the air; there are no sad faces in sight. Ahead of us is another wonderful boat trip on the ferry, 1 1/2 hours of sunshine and views over the archipelago that are to die for. 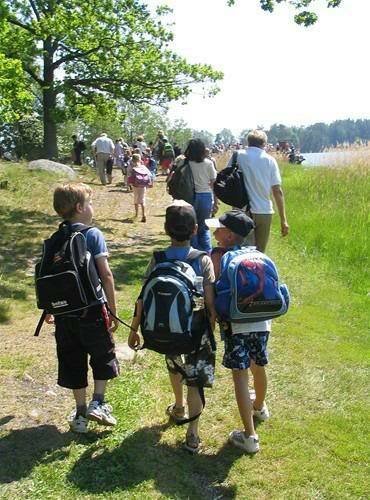 The island is a perfect day out for everyone that loves to be in nature. As the trails on the island are so very well kept, wide and easy to go on; the larger trails are even accessible to wheelchairs and baby carriages during the summer when the ground is hard. When you get back to the ferry a bit too early, you might enjoy dropping by at the small visitors' centre which has an exhibition on the islands natural and human history. The visitors centre is located very close to the ferry dock. 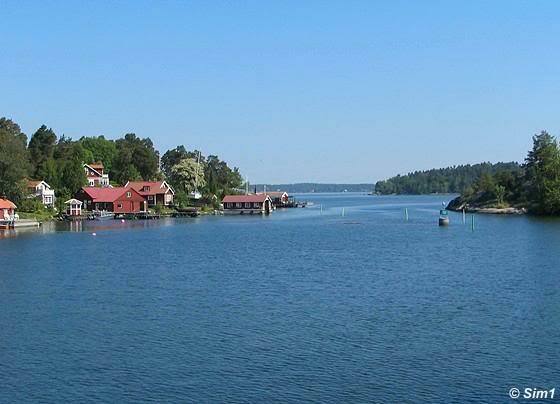 The island of Ängsö is located approximately 8 kilometres east of Bergshamra in the inner Roslagen archipelago in Norrtälje Municipality, Stockholm County. 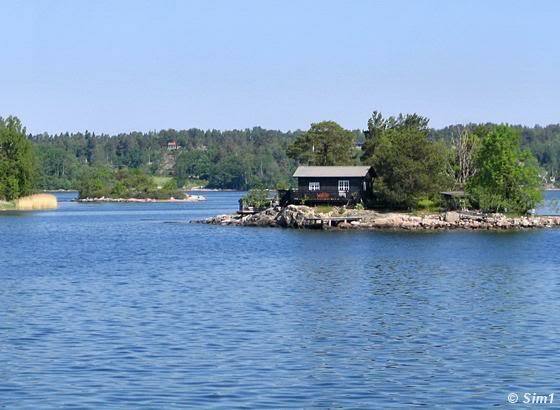 Roughly said it is in the archipelago north east of Stockholm. to go to their destination pages.